It’s a rare scoreline but one that has more resonance than any other result in 150 years of recorded football, particularly in the Budapest bar that shares its name: 6-3. The game of course was England 3 Hungary 6, Wembley Stadium, November 25, 1953. It is known as The Match of the Century. The anniversary celebration at the bar is a simple, sombre affair. Through the day and into the evening, men in dapper hats drift in and out of the place. They cast a glance at the annual display of magazine features long folded into place and silver-framed portraits, illuminated by candles on a tabletop of offerings. They take in the old sepia newspaper match reports forever mounted on the walls of the vintage cabin. They courteously greet the landlady, Marika néni, order a short drink, a Unicum, perhaps, and then they leave. It’s November 25. Another anniversary to mark the highpoint of Hungarian football and a reminder of its later demise. Above them a small TV screen beams the game on video loop, brought to life by György Szepesi’s heart-in-mouth radio commentary that gripped a nation. Urban legend has it that during the game a balcony collapsed somewhere in Budapest, so passionate was the gathering around a radio set -though it would have been as freezing behind the Iron Curtain in Hungary as it was foggy at Wembley. The match was an international friendly. Hungary had been invited to London the year before by English FA secretary Stanley Rous when he presented their gold medals at the Olympic football final in Helsinki. England considered themselves masters of the game. Their approach was simple: play a 2-3-5 formation with plenty of running, and it for a long time it worked: the national team had never lost at home to anyone outside of the British Isles. However this record is something of a red herring—since their first match in 1872, England had hosted Continental or South American opposition a mere 21 times. Early football pioneers, Hungary played in the first international on Continental Europe in 1902. The Hungarian game was then reinvented by an Englishman, Jimmy Hogan. The wily Lancastrian knew that England might consider itself the home of football but Scotland was its true creator—it was they who introduced passing to the sport. Hogan was already a student of savvy Scottish interplay from his playing days at Burnley and Bolton when he arrived at MTK Budapest as a World War I internee. He began to coach Hungary’s leading team in what would become known as the Danubian School of football, all swift passing, running off the ball and positional interchange. By 1953, MTK manager Márton Bukovi had perfected these tactics into a fluid 4-2-4 formation that he introduced while assistant to Hungary’s national coach, Gusztáv Sebes. With two strikers of rare quality – Péter Palotás and Nándor Hidegkuti – at his disposal, Bukovi worked on deploying a deep-lying centre-forward who could direct play and pull opposing defenders out of position. Meanwhile beneath the ivory towers of Wembley, then called the Empire Stadium, England had recently beaten France, Sweden, Italy and Argentina. Their team included a genuine, once-in-a-lifetime great, Stanley Matthews. Most of Hungary’s team played for club side Honvéd in bucolic Kispest, where its two stars Ferenc Puskás and József Bozsik had grown up several houses apart. Hidegkuti was now first-choice central striker, able to drift behind the forward line. Before 100,000 spectators at Wembley, Hidegkuti took only 45 seconds to score the opener. He would outfox the static English defence, move after move after move, for the remaining 90 minutes. Centre-forwards weren’t meant to do that. The third goal is the most celebrated from that game—the Puskás dragback. His later lifelong friend, England captain Billy Wright, was famously described as ‘running to the wrong fire’ while the Kispest urchin made the ball disappear with a lightning-quick sleight of left foot. Puskás had first created the chance by switching flanks with Zoltán Czibor. England didn’t know whom to mark. On the radio commentary in the bar, Szepesi laughs as Puskás kisses an England player on the cheek when making his way back to the centre-circle, immortality achieved in one swift moment. The mounted newspaper photos at 6:3 tell the rest of the story. Hungarians running away laughing as Alf Ramsey yet again fishes the ball out of the net. Magyars in cherry-red shirts, arm aloft in celebration. Reserve keeper Gellei and Puskás, squat and stocky, at least a head shorter, embrace. After the whistle blew for the world-changing 6-3 win, the Hungarians ran to salute Jimmy Hogan, sitting in the crowd that afternoon. Six months later, would beat England 7-1 in Budapest but lose the World Cup to West Germany in the final, the result of an injured Puskas and a questionable offside decision. Key players, including Puskás, would stay in the West after the 1956 Uprising in Budapest. 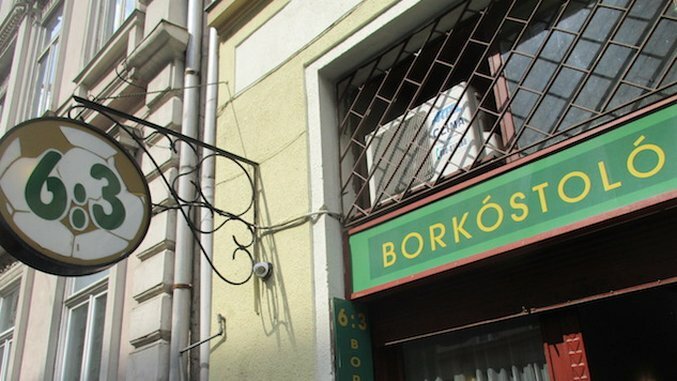 His boyhood friend Bozsik remained behind the Iron Curtain, as did Hidegkuti, who later opened this 6:3 bar. After he died in 2002, it passed to current landlady Marika néni. An England goalscorer in 1953, Jackie Sewell passed away this September, the last survivor from either side that day. Ramsey, who converted a penalty, became England manager in 1963. For ten years, his players had been practising more running while Hungary’s had sulked or gone abroad. Ramsey would win the World Cup with a safety-first 4-4-2 formation and another iconic scoreline: 4-2. Budapest-based Peterjon Cresswell runs www.liberoguide.com, a worldwide travel guide for soccer fans.